Heights will be increased from 14 to 17 stories for Broadway buildings that contain some “affordable” units (details below). Communities across the city rejected these sweeping zoning changes and remain concerned about the lack of explanation and outreach on City Council’s “deal” with the Mayor. The full Council is scheduled to vote both proposals into law today, March 22. City Council eliminated height increases for new market-rate development in the “Manhattan Core” (including the Upper West Side between 59th and 110th Streets). 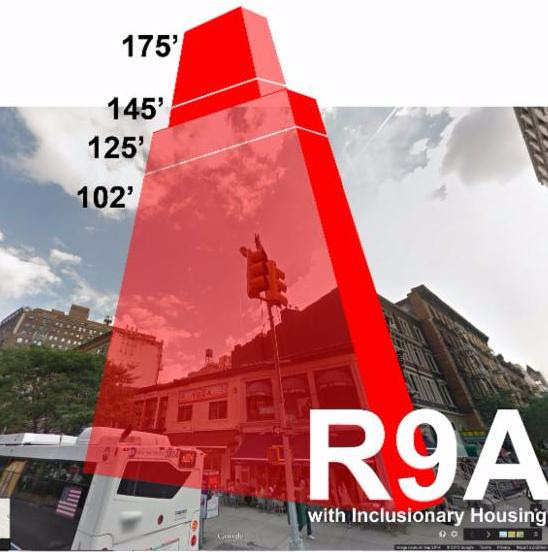 Height increases of up to 30 feet will still apply to new development that includes at least 20% “affordable” units (not necessarily on site) in areas shown on this map (Broadway’s R9A district, for example, including blocks that were carefully rezoned just a few years ago but recently carved out of the new Riverside-West End Historic District extension). Affordable housing need only be maintained for up to 30 years (the extra height is permanent, of course). Rear-yard setback requirements are protected on residential side streets, but relaxed for Affordable Senior Housing on commercially zoned or wide streets (such as major avenues and cross streets). The “Sliver Law” preventing tall, skinny buildings on side street midblocks remains intact. Housing is now required to provide a deeper range of affordability for low-income residents, and there must be more of it. New affordable housing must be permanent, but not necessarily in the same community (meaning that new development could still drive down overall neighborhood affordability in these zones). These are all significant changes to the proposals originally introduced by the Department of City Planning, with the strong support of the Real Estate Board of New York and others. But note: It took almost exactly ONE YEAR of aggressive grassroots advocacy, “NO” votes from nearly every Community Board throughout New York City, and Council Members seeking to protect their own districts to reshape the Mayor’s tone-deaf, “one-size-fits-all” zoning changes. Is this the way to introduce policy that has been touted as the most ambitious housing plan in history? No, it is GOVERNMENT IN THE DARK. But Mayor de Blasio says “The work is done” (New York Times, 3/17/16), explaining why he abruptly closed down the slush fund set up to push his affordable housing plan (under fire for potentially violating conflicts of interest and campaign finance rules). The saga of ZQA/MIH is a sobering reminder of how we must remain ever vigilant to defend the character and livability of our neighborhoods and city as a whole. Finally, THANK YOU to everyone who signed up, showed up, and spoke up! You are the true heroes. About that, we have no doubt!